Recently, there has been a lot of talk of electric cars and connected cars and self-driving cars. Car racing has been slow to catch up to all the newfangled technology coming down the passenger car pipeline. That said, I recently had a chance to experience the next generation of electric car racing called Formula E at the Faraday Future Long Beach ePrix. Think of F1 racing—and the team behind F1—but the open wheel cars are electric and, while not as fast, nor as loud, just as exciting to watch. Formula E likes to think of itself as the future of sustainable motor sports and manufacturers use research and development from the series on the next generation of electric vehicles. Which is why it was so interesting to see companies like BMW—which came close to setting a world record for the world’s longest BMW parade, which was made up of mostly i3s—and Gardena’s own stealth mode electric car, Faraday Future, show up at the event. While FF and BMW didn’t have cars in the race, they did bring a touch of consumer facing electric auto tech to the event. While the racing is fine and dandy—and a lot more interesting than the event I went to in Miami in 2015—the highlight was seeing Leonardo DiCaprio watch as the ABT Schaeffler Volkswagen Team’s Lucas di Grassi seized a barn-burner of a win past Team Venturi’s Stéphane Sarrazin by less than one second (0.787 of a second, to be precise, with Di Grassi’s teammate Daniel Abtcame placing in third). DiCaprio, long a supporter of sustainability, has been a partial owner of the Team Venturi since Formula E’s 2014 debut. The final event of the series— a double-header—takes place in London over the weekend of July 2 and 3 and is sure to be a rollicking good time as the two points leading teams—Renault e.Dams and ABT Schaeffler Audi Sport—are very close in the standings. As in most winner’s circles, much champagne was sprayed, courtesy of sponsor Maison Mumm, which debuted a new bottle designed by English designer Ross Lovegrove that features the classic Mumm red ribbon indented into the glass bottle. While the Gentleman Journalist did partake in the imbibing, as well as learning how to open a bottle of Champagne with a sabre, he did not drink and then drive an electric car. Auto racing, especially open wheel racing, is in itself quite glamorous and the glamour was extended to the Chateau Marmont, where the Formula E Gala was held. 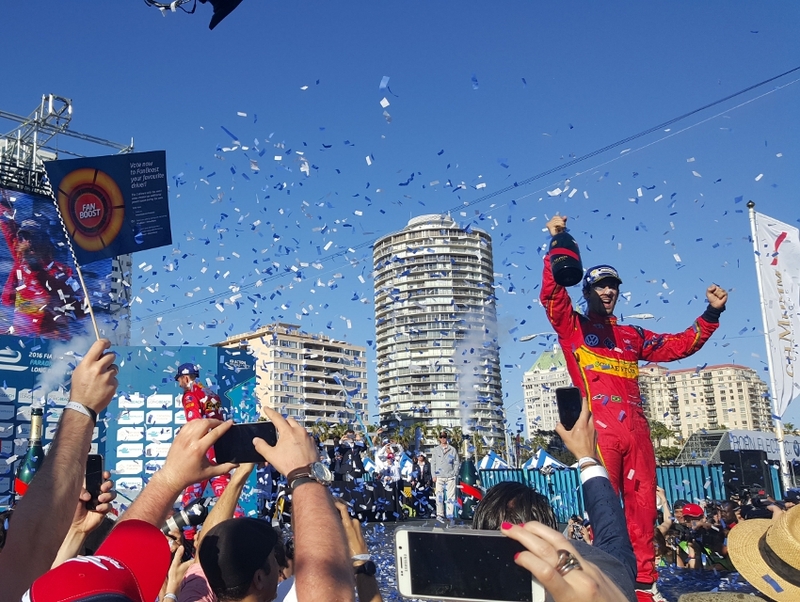 DiCaprio, The Duchess of York, Stephen Fry, Kevin McKidd, and Melanie Griffith were all in attendance to watch as Formula E’s new Chief Revenue Officer Sam Piccione outbid several others for a winning driver-signed Maison Mumm championship bottle. Fresh off his Oscar win, it looked as though DiCaprio did not have a care in the world and why should he? Champagne, electric cars, sustainability and an evening at the Chateau, now that’s my kind of race day.